Born in Stockholm on the 25th February, 1947. He studied painting in the early 70s before studying at EMS (Institute for Electro-Acoustic Music) in Stockholm with Rolf Enström and Jan W Morthenson. Tankred is interested in musical encounters with other art forms,particularly pictorial art, which has resulted in fusions where his music has also functioned as installations at exhibitions. The multi-slide presentation Riot which was shown in Berlin in 1988 was created in collaboration with the graphic artist Leif Elggren. Tankred and Elggren work together on a regular basis as a performance duo,calling themselves The Sons of God. Tankred aims to strengthen the ties between music, movement and image and also to avoid conventional forms of expression. 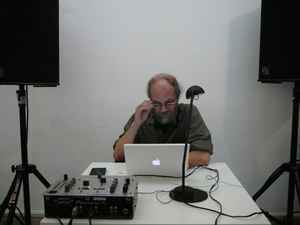 He often uses a "concresizer", a kind of instrument which he has constructed himself which controls different types of sound sculptures from a keyboard. His works have been exhibited in different places in Sweden and Europe. Tankred has been the president of the Fylkingen society between 1993-98.